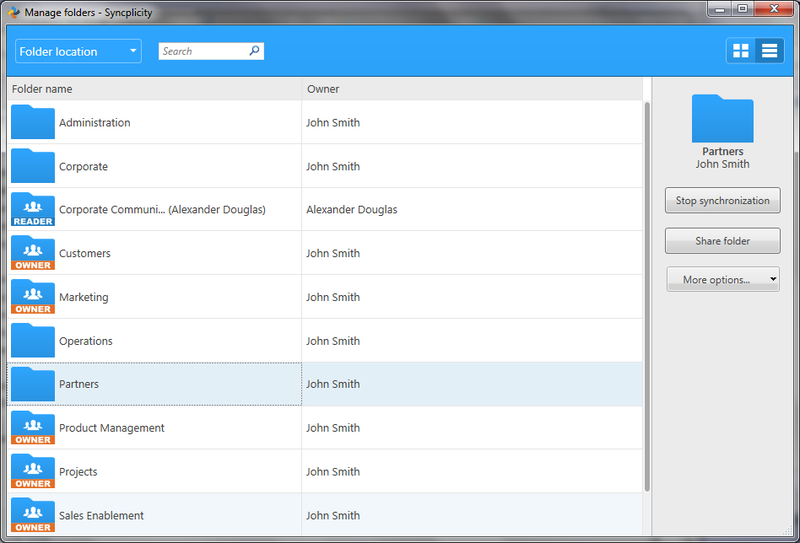 You can filter and search the list of folders within your Syncplicity account. You can use the tabs at the top to filter the view of the top-level folders so that you see which folders are on your system and which are in the cloud, and which are shared and which are not shared (private). If viewing shared folders only, you have a third tab that allows you to see which folders are owned by you or other users. For long lists, enter text in the Search field to find a specific top-level folder. Using the squares icon and horizontal line icon at the upper right of Manage folders, you can switch between list and tiled views. You can use filtering and search regardless of the view.